This was my first time staffing our council’s High Adventure Training (HAT) course. We recommend this course for any adult leading a backpacking trip of more than a few miles or more than a weekend. With three long weeknight sessions and a two night backpacking outing, we go into a lot more detail on risk management, navigation, weather, lightweight gear, and so on. Our course director was hoping for rain, not because he enjoys it, but because it puts the participant’s skills under additional stress, allowing them to learn more. Some lessons are straightforward, like learning that your jacket leaks. Others are more subtle, like using a map in the rain or cooking and eating dinner in the rain. Rain started after bedtime Friday and continued until early Sunday morning. It was 48º straight through, ideal hypothermia weather if we’d had wind. The rain let up a few times in the afternoon, I even took off my rain shell for a bit, but it was mostly a rainy, cold weekend. If you haven’t been in a redwood forest, the tree drip continues long after the rain has stopped. Half of the precipitation in a redwood forest is tree drip. You can’t tell whether it has stopped raining until you step into the open. We camped under trees, of course. Luckily, it was dry and sunny at home, so I could dry out my gear. Like the participants, I found a few holes in my planning and skills. The rain skirt is only useful when it is with me. That thing is so small that I don’t notice when it is not packed. I need a way to always bring it. GPS is not magic. When I emerged on Butano Fire Road, I got turned around and took the scenic route about 1.5 miles the wrong way. Then back. I sorted it out with the map and landmarks. Time to acquire more competency with GPS. Having a single destination GPS waypoint seems like a weak approach. It was very hard to keep context when zooming or panning. With two or more, I think I would have a sense of scale on that tiny screen. Hike in groups when you can. I hiked an unknown trail solo when I could have gone with two other staffers. Pretty sketchy trail, too. I took a wrong turn and hiked an extra three miles. The buddy system is a Tenderfoot requirement, and this is why. Rookie mistake. Take David and Gordon’s advice about shedding layers for the steep trail out of base camp. I overdressed and my base layers got sweaty and stayed like that all day. There ways no way to dry out in 100% humidity. Bring a couple of Esbit tabs as firestarter. I don’t make a campfire on my own, but an evening campfire was part of this course and all the wood was wet. Take the Gerber LST lock blade knife next time. I left it at home to save weight. It would have been handy for shaving some dry kindling. The tiny Swiss army knife did not work for that, it kept trying to fold back on my fingers (scary!). The LST is 36 grams that is going back into my pack. Consider bringing a small camera. Some photos of a rainy HAT course would be good. Think about bringing my ham radio transceiver and working the world, if I’m going to have that much spare time. Some of my decisions were just right. It is a bit of a relief that I’m not completely hopeless in the woods. I’m still very happy with my shelter combination: Mountain Laurel Designs Speedmid, Gossamer Gear polycyro ground sheet, and Titanium Goat Ptarmigan bivy. It has been great in every kind of (three season) weather. With eight titanium stakes, that is two pounds of awesome. Most people would not use the bivy, but breezes across my face keep me awake, so I snuggle down in that. 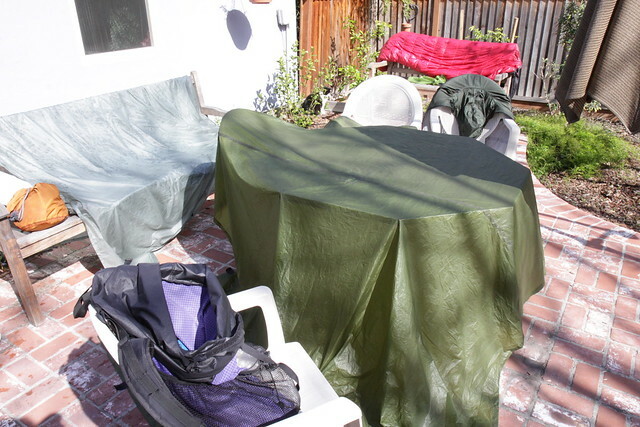 The 8×10 flat tarp was an excellent addition. At my station, I spent most of three hours under it rather than sitting out in the rain. Nice. The White Box alcohol stove was my backup while I was trying out the Solo Stove. That was good, because I really did not feel like building a wood fire in the rain for breakfast. Maybe next time. The cup of instant black bean soup was great while dinner was rehydrating. I used that paper cup as my dinner bowl, too. Leaving the big digital SLR at home was fine. It would have been a worry keeping it dry. Freezer bag cooking is still working for me, especially with a new cookbook. First time with a potato meal, but that is another post. The Crazy Creek chair is still a good idea, taking a book was good, too (read 200+ pages). I decided to try lightweight socks instead of thick wool socks. Total win. No blisters even from a downhill with a lot of skidding on leaves, and not as much wool to get soaked. My Six Moon Designs Starlite pack is a good size. I’ve been thinking of getting a smaller pack, but I took fleece insulating layers on this trip and packed some extra instructional material. My pack wasn’t full, but this is probably too much volume for a smaller pack. If you are a dedicated lightweight packer, you’ll see a lot of extra stuff on this list. That stuff is part of being a trainer or a Scout leader. I can set up or break camp quickly, but I might spend a lot of time sitting around while the rest of the troop does it. Or I might spend a long time waiting for a patrol (adult or youth) to navigate and hike to my location. Or I might be hanging around a campfire for Thorns and Roses. That means more insulation, a chair, some daytime shelter, and maybe a book. Overall, it’s hard to complain about a two day trip where I learn that much, even if it was miserably wet and rainy.